Michael Dunlop and John McGuinness with the MD Racing Honda Supersport machine on the Isle of Man on Wednesday. John McGuinness and Michael Dunlop have joined forces in a sensational move that will see the Morecambe Missile compete in the Supersport races at this year’s Isle of Man TT for Dunlop’s MD Racing team. McGuinness will ride a Honda CBR600RR in the colours of Dunlop’s privateer outfit as he makes his return to the Mountain Course after missing the event in 2017 through injury. Morecambe's John McGuinness will compete in the Supersport races at this year's Isle of Man TT for Michael Dunlop's MD Racing team. The 45-year-old and Ulsterman Dunlop, who have an incredible 38 TT victories between them, revealed the idea came about following some light-hearted banter. Dunlop, who remains the lap record holder for the class after lapping at 128.677mph on his way to a double win on the CBR600RR in 2013, said: “I hadn’t ever really planned on building another bike, but when John started talking to me about it, I thought it was a great idea and I couldn’t really say no. “It’s good for me, it’s good for my team and no matter who you are, the man has won 23 TT races so there is always going to be something that can be learnt by having him working alongside you,” added Dunlop, who won the sole Supersport race last year on a Yamaha R6. McGuinness, who joined Norton this year after his long association with Honda Racing came to an end, was victorious in the class in 2005 and 2006. He also added podiums to his glittering haul in 2007, 2008, 2011 and 2013. The 23-time TT winner said: “I’m excited to be riding Michael’s bike at this year’s TT. It’s started off as a bit of a joke conversation between us both and has developed into him going off and building me a bike. “I’m a big fan of Michael’s both as a rider but also for what he has done in terms of running his own teams and winning races out the back of his van against the factory teams over the years. “The Dunlop name means so much to TT fans and as a fan myself, I can’t wait to represent that name at this year’s event,” he added. News of the exciting tie-up was confirmed on Wednesday ahead of the official launch of the TT at the Villa Marina in Douglas. 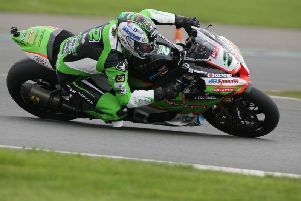 It has also been announced that McGuinness will make his debut in the Lightweight race at the TT this year, riding a Kawasaki for Ryan Farquhar’s KMR/IEG team. The Monster Energy Supersport races are scheduled to take place on Monday, June 4 and Wednesday, June 6.